We met many characters along the way. Hugs were abundant. A Guinness World Record could have been set with this hug. And if you are wondering who this is...so am I.
Logan was concerned that Santa was here and not making toys in the North Pole. Santa told Logan that he was in a supervisory role and had elves to do the work. Logan still thought he was cutting it too close to Christmas. Notice Ryan's hand around Mickey's waist. Ben learned quickly that the characters hands were great to chew on. Ben only had eyes for Jessie. Poor Woody - he was intent on giving Ben a big hug. Who is the happiest in this photo? For more information on the Ace & TJ's Grin Kids Organization, check here. 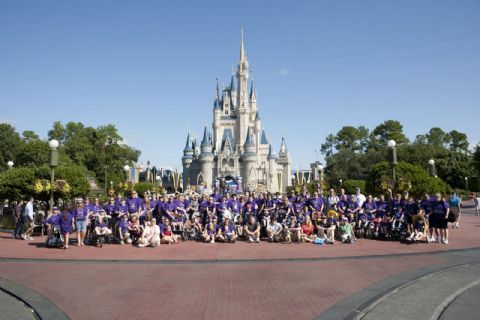 20 families were invited this year on the Ace & TJ's Grin Kids Trip 2011. Families were from North Carolina, Virginia, Alabama and Tennessee. We did not know each other before we started on our journey, but by the end of the 5 days in Disney, many connections and friendships were formed. Although we did not stay together as a group all day, everyday - it would be impossible with over 100 people - it was great to see another family on a ride or share a spot on the parade route. 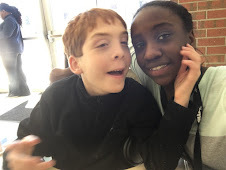 Our common denominator, raising a child with special needs, was a good conversation starter, and lead us to other topics, like our work, family life and outside interests. It was a relief when, as a group on the plane, bus or restaurant, and Ben was yelling or making loud noises, that not one person was looking at us in a way that said, "Could you please quiet that child?" We were all in the same boat and understanding and patience were plentiful. Judgement was not. If you have ever gone on a retreat or been part of something large, it is hard not to form a special bond with the other people with you. The Grin Kids Family, for which we are now a part of, is large - 12 years worth of trips. Families from past trips did several special things for us - an embroidered Disney bag with our family name on it, a refillable Disney cup and countless other gifts that made the trip even more special knowing that people were thinking about us. The gifts were beautiful, but the person who made the most impression on me was the woman, who welcomed us at the Charlotte airport. She was a Grin Kid on one of the very first trips. Obviously, the family bond is strong. The experience never forgotten. Photo credit goes to Angus Lamond, the photographer on the Ace & TJ's Grin Kids Trip 2011. Just got back from the Disney Orientation meeting for the Grin Kids trip. At one point, I had tears in my eyes and we are not even there yet. There may be a flood when we actually arrive on Wednesday. It is amazing what this organization has in store for us. 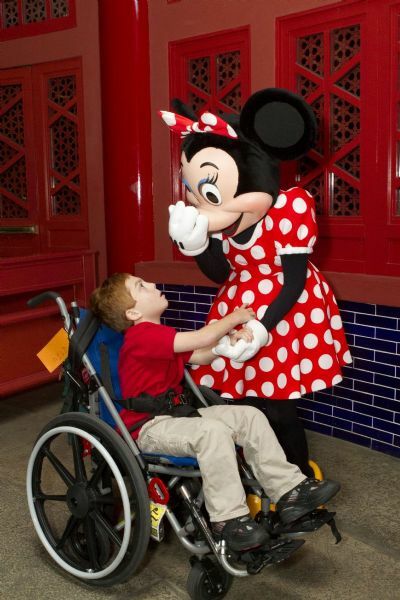 Every detail is planned out to make it simple to travel with our children with special needs. We drop off our luggage at the airport and do not see it again until we get to our room. Meals, transportation, park passes, special events, souvenirs, snacks...anything you can think of is all taken care of for all 20 families. Ace & TJ will be interviewing families throught the trip and playing the responses on their morning show. If you are impressed with what you see, consider volunteering or donating for next year's Grin Kids Trip.